Students from the Principles of Natural Resource Management course undertook a series of hands-on projects out in the EcoPreserve during the Fall 2015 semester. 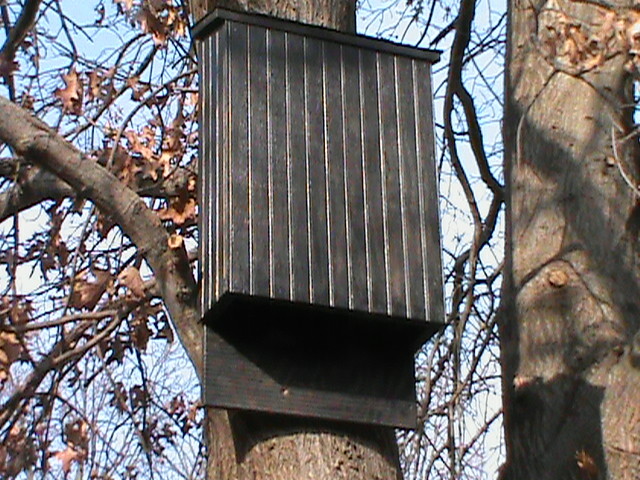 These projects included everything from the installation of bat maternity colony nesting (see photo above),solitary bee and bluebird boxes to riparian zone, pollinator meadow and vernal pool restoration projects to monitoring of small & large mammal populations, invasive plant species and diseased trees. To foster greater connections between the EcoPreserve and adjacent Livingston Campus, a new set of trails and gateway kiosk linking to the Rockafeller Road-Avenue E Roundabout were developed in 2013-2014. The newly completed gateway kiosk is dedicated to the memory of Charlie Kontos, Jr. At the time of his death in 2010, Charlie was in the process of completing the doctoral program at Rutgers in the Department of Ecology, Evolution & Natural Resources. This Kiosk is dedicated to Charlie’s commitment and vision in protecting wildlife and the environment. Funds for construction of the kiosk were generously provided by the Kontos family. A ribbon-cutting ceremony is planned for Sunday, November 16, 2014 at 10:30 am. 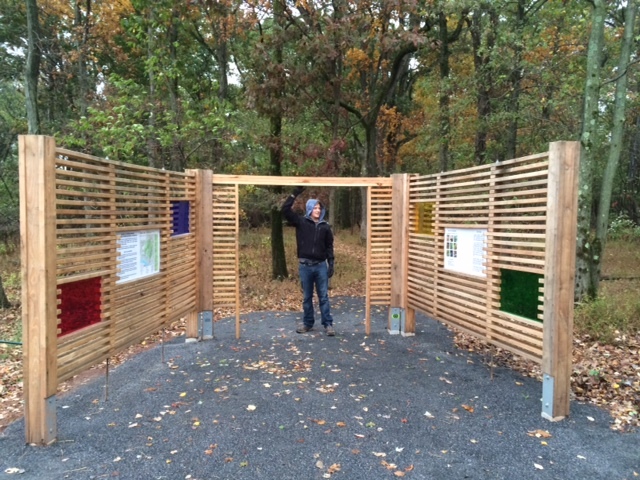 The Kontos memorial kiosk was designed and constructed by Brian Curry, a 2012 Rutgers Landscape Architecture graduate, with the assistance of EcoPreserve Faculty Director Rick Lathrop. This kiosk is built with locally sourced, sustainably harvested black locust lumber. Black locust is a native hardwood that can be installed without any chemical sealing or pressure treating. The colored acrylic panels allow visitors to see the environment in a different light. Looking through the colored filters, one can see that each panel interacts with the colors of the landscape differently. John Bognar designed and produced the map and other informational panels, while Brian Curry designed the memorial plaque. The kiosk was planned and constructed with the enthusiastic help from a number of folks: School of Environmental & Biological Sciences Executive Dean Robert Goodman and Rutgers Facilities % Planning were instrumental including Frank Wong, Jeffrey Livingston, Tom Manning, Dianne Gravatt, Patrick Harrity, Chuck Roper, David Morrow, Geoff Kleid; Mark DiOrio provided absolutely crucial advice and assistance at many points along the way; Rich Murphy of Action Tree Service helped mill the locust posts; the 2014 EcoPreserve Trail Crew (Patrick LePore, Dom LaValle, Kendall Miller) contributed some needed muscle; Charles Colline, Charles Kontos Sr., and students from the RU Outdoors Club and Natural Resources Management class volunteered additional help. 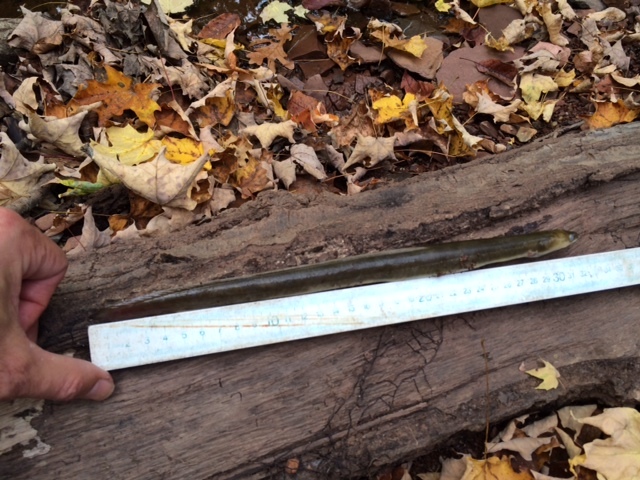 Students in the Principles of Natural Resource Management class were doing stream surveys on October 7, 2014 and found this foot long American eel (Anguilla rostrata) (dead) in a pool along Buell Brook. Eels have a fascinating life history that connect the EcoPreserve to the distant waters of the Sargasso Sea. Adult eels leave the US coast to swim out to the Sargasso Sea near Bermuda to spawn. The young hatch and move north with the help of the prevailing currents before heading into East Coast estuaries. The males generally stay along the coast while the females head upriver. 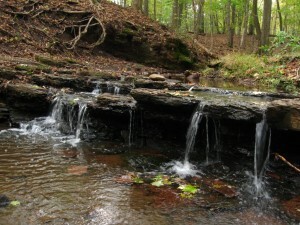 The young eels (called elvers) live in headwater streams and other freshwaters, like Buell Brook. Spending the day buried in the sediments and debris at the bottom, they come out at night to feed. The eels take up to 20 years to mature before returning to the ocean to spawn. While we knew that eels lived in Buell Brook, this is by far the largest we have found. 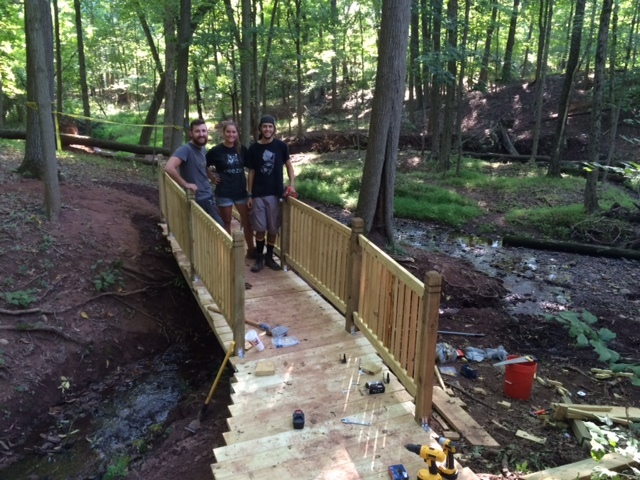 The 2014 summer trail/land stewards crew has been hard at work maintaining and upgrading the trails in the EcoPreserve this summer. Highlights include improvement of the boardwalk on the Green Trail, trail bed filling/chipping, and the construction of a new bridge on the Blue Trail. The crew has also assisted in the construction of the new trailhead kiosk off of the Livingston Campus Avenue E/Rockafeller Road roundabout. 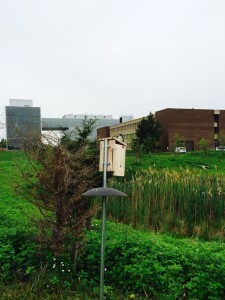 In the fall of 2013, Principles of Natural Resource Management students Sara Morris-Marano, Danielle Podmayersky, Brittney Chrans and Noha Haggag built and installed 6 tree swallow boxes around the newly constructed stormwater detention basin/wetlands adjacent to Avenue E on Livingston Campus. Four of the 6 boxes are now occupied with the swallows swooping back and forth across the wetlands snatching up insects to feed their young. Tree swallows have a violet-green back, white underside with a slightly forked tail. Run for Woods! 5k run will be held on Saturday May 10 at 9am. This event is organized by the RU Ecology & Evolution Graduate Students Association. Proceeds go to the Livingston Eco Preserve for trail maintenance and habitat restoration. All are welcome and please invite your friends and family for a fun day! Snacks will be provided for all runners/walkers afterwards before the award ceremony. Prizes will be available for winners of each age group (male and female). This winter’s heavy snows brought with it a great opportunity to enjoy the EcoPreserve’s trails on cross-country skis or by snowshoe. 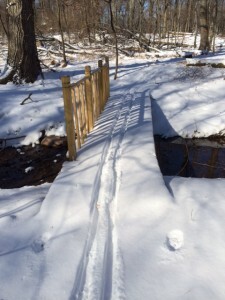 With its varied terrain and many trails, the EcoPreserve is one of the better places to cross-country ski in Central New Jersey. One memorable ski this winter had a pair of great-horned owls hooting a duet while a near full moon rose in the east. Several students in the Principles of Natural Resource Management class conducted a month-long survey of wildlife using motion-activated digital cameras stationed at various locations in the RU EcoPreserve. The resulting images revealed an abundance of deer (Odocoileus virginianus), red fox (Vulpes vulpes), feral cats (Felis catus) and raccoon (Procyon lotor) throughout the Preserve. 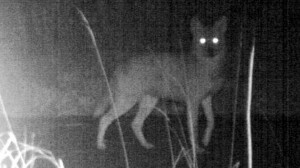 They also captured photos of a pair of coyotes (Canis latrans) at one of the camera stations (see photo above). A deer damage management program that will take place within the Rutgers Ecological Preserve and nearby lands on Livingston Campus from December 21, 2013 to January 19, 2014. The intent is to reduce the overpopulation of deer in the EcoPreserve through a managed bow hunt. · The deer damage management program is coordinated by Rutgers natural resource and wildlife conservation professionals with the participation of the Rutgers University Police Department, the Rutgers EcoPreserve Advisory Committee and the Friends of the Ecological Preserve. · Officials of the New Jersey Division of Fish and Wildlife are monitoring the program to ensure that participants follow all relevant state hunting regulations. · The EcoPreserve will NOT be open to general recreational hunting. Access will be restricted to a small number of state-licensed, vetted and permitted bow hunters who will enter through Rutgers property at a location designated by the university. · Hunting will be allowed only in specified sections of the preserve and adjacent lands during dawn to dusk hours (approximately 6 am to 6 pm daily). · Regulations on no-hunting zones around private parcels will be strictly enforced. · The deer damage management program zones constitute less than 140 acres of the more than 400-acre EcoPreserve. · Between December 21, 2013 and January 19, 2014, the specified management program zones will be closed to public access. Warning signage will posted. The remainder of the EcoPreserve will be open. · During this period, we request that visitors to the EcoPreserve stay on marked trails, do not enter posted areas, keep pets leashed and wear brightly colored clothing. 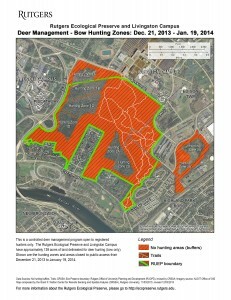 For more information about the deer damage management program please go to www.ecopreserve.rutgers.edu, then go > About the RUEP > Deer Damage Management Program. Explore the EcoPreserve’s Interactive Maps!